The Senate of Virginia is the upper house of the Virginia General Assembly consisting of forty members who represent single-member districts. It was created through the Virginia Constitution ratified in 1776. Prior to that time, the upper house of the General Assembly was known as the Governor’s Council and consisted of individuals appointed by the Governor of Virginia. Senators serve four-year terms and all stand for election at the same time. Daymuse has been supporting the VSRC's web prescense since 2008. 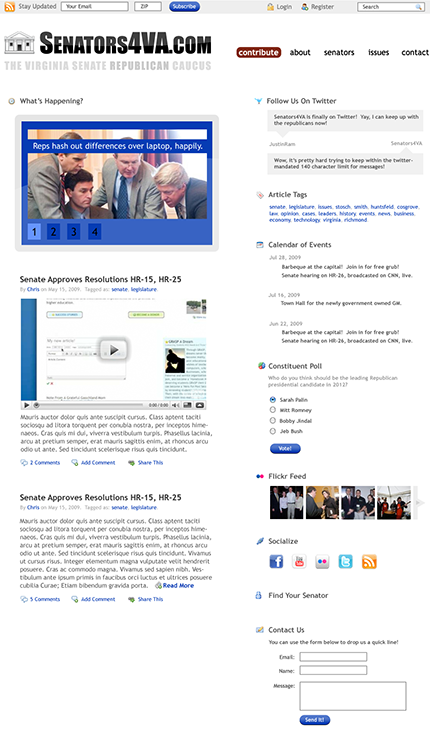 "We want to connect to our Constituients and further our reach"
The Virginia Senate’s Republic Caucus wanted to rebuild their online pretense, and with it, an easy-to-use updatable content management system. The VSRC also needed branding, design, and information architecture expertise as well as hosting which meant this would be an end-to-end project.